Ford is well set to bring its latest Endeavour badge to India in January 2016. Going forward Ford will be offering two engines and two transmissions to choose from. The 2016 Ford Endeavour would be getting smaller 2.2-litre unit engine that together delivers 160PS of power and 385Nm of torque, and can be optioned with either a 6-speed manual or a 6-speed automatic transmission gearbox. The larger engine of Ford Endeavour has engine capacity of 3.2 litres and is capable of delivering a power of 200PS and torque of 470Nm however this engine is only available with 6-speed automatic gearbox. In the other hand, the 2.2 litre engine with the manual transmission is offered in both 4×2 as well as 4×4 variants, while the one with the automatic will be sold only as a 4×2. The 3.2-litre engine of Ford Endeavour is offered only in 4×4 configuration. 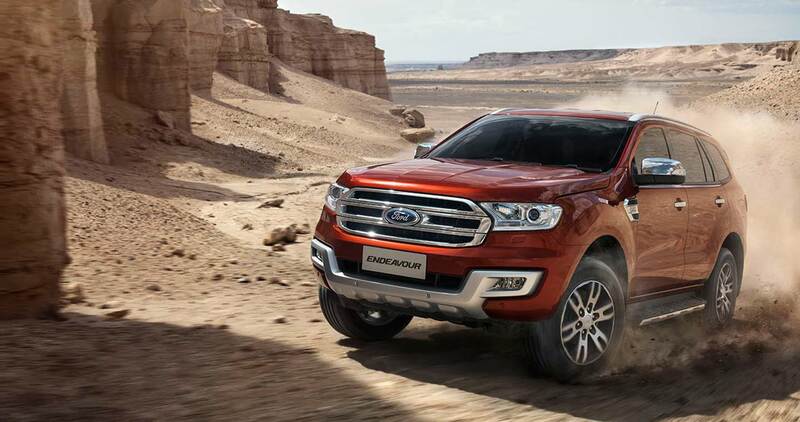 The 4×4 variants of 2016 Ford Endeavour would be getting the Terrain Management System with 4 different modes – Sand, Snow, Mud and Rock. The American automaker, Ford has fully packed the Endeavour with a bunch of tech features to increase its appeal. The 2016 Endeavour gets a powered tailgate, electronically folding 3rd row seats, active noise cancellation, a touchscreen infotainment system plus semi-automatic parallel park assist. When it comes to safety features of Ford Endeavour, this powerful car will be getting Ford’s MyKey, seven airbags, hill-assist, hill descent control, ESP, traction control as well as ABS with EBD.